The 11th annual Back2School Run 2015 (B2SR’15) proved once again that September isn’t just for new notebooks and sharpened pencils. B2SR kicked off the fall wheeling season with a bang! Base camp this year was the Shir-Roy Campground where, like last year, we had a whole section of the campground booked exclusively for Nexterra. Wheeling was on the Little Monadnock Family Trails. We had 36 registered drivers, plus their guests, who started arriving from early on Friday afternoon, then into the late night, with the final numbers arriving by early Saturday morning. The weather was much warmer this year, providing comfortable nights. The Saturday activities started with a drivers meeting led by Mike C. & Ernie. The drivers then split into three main groups – greens, blues & black trail groups, and headed out to LMFT for a full day of wheeling. This year, some of the trails were impacted by recent logging activities, but that didn’t take away much from the wheeling experience. Over the course of the day, folks had a great time with all groups tackling some interesting challenges on the trails. Later that night, back at camp, we were treated to a fantastic BBQ dinner – Ernie, Mike R. & Chris did a great job on the grills, filling our hungry bellies after a long day on the trails. MC’s Tiff and Mike C. provided after dinner entertainment by hosting an awesome raffle, with a multitude of prizes from our sponsors. We also had a special raffle for a Power Tank that went home with Michelle Landry! The night wound down slowly around campfires. Our members shared their trail experiences and discussed trail damage and what we wanted to do to our rigs for next year. After a good night’s rest, we enjoyed the co-op breakfast that was coordinated by Michelle. The rest of the morning was spent cleaning up and breaking down camp. We want to thank all those who attended, for being a fantastic crew to wheel/camp with, and most of all for being part of Nexterra! A big THANK YOU goes out to our event sponsors!! We truly appreciate all of your donations! Until the next Nexterra event… tread lightly my friends! A big thank you to all attendees, sponsors and organizers of the 10th annual North East Xterra Club’s Back-2-School Run, for making the weekend one of the most memorable events in our clubs history! In addition to celebrating 10 years, the Back 2 School Run this year featured a brand new location! Our base camp this year was the Shir-Roy campground in Richmond, NH. Nexterra had a section of the campground reserved for our members which made this super convenient to hangout. Most folks arrived during the day/night on Friday to setup camp and settle down. Campfires and warm sleeping bags were a necessity, as the temps dipped into the upper 30’s that night. The next morning was surprisingly warmer than the night, and turned progressively warmer as the day went by. After coffee & breakfast, our club president Mike Ciccolo worked out the details of checking off registered folks, and handed out swag bags, event t-shirts, raffle tickets, and Subway lunches. Ernie Leland, a member of our club’s Events Committee, then led us through the drivers meeting and safety briefing. 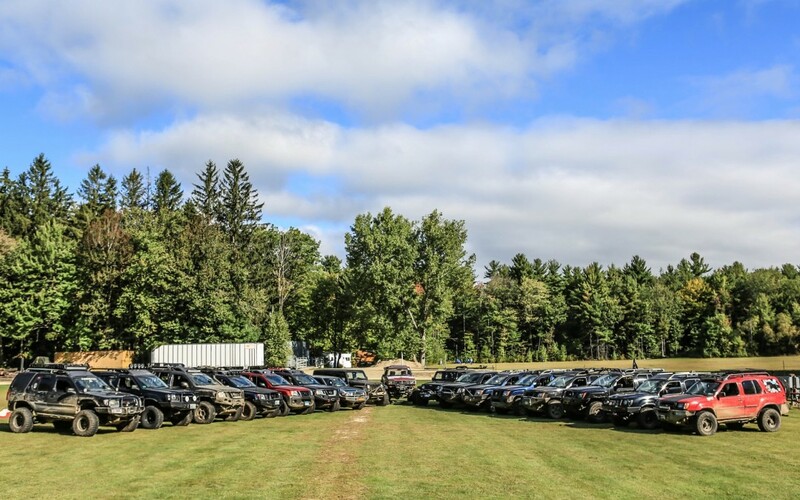 17 Xterras, 3 Jeeps, 1 Pathfinder and 1 Hybrid 4Runner made up a formidable convoy, and drove the short distance to the trails at LMFT. Once there, the group split into the stock/green group, intermediate/blue group, and the hard/black groups. The trails were all very fun with the blue/black trails providing plenty of challenges, and more than a few ‘Oh Sh’ moments – even for the most modified rigs and the most experienced wheelers. Even the green trails provided plenty of excitement. Due to the nature of the obstacles, trail breakage & damage were plentiful in the blue and black groups. With team work and much joviality, all fixes were done, and we were able to enjoy the rest of the day. By 8PM, all groups had returned to the campground with no critical damages. The blue group had stayed out as long as they could, taking in some night wheeling for good measure. Once back at the campground, we were treated to some great BBQ to satisfy our hungry selves. Kicking back, we caught up with each other on the adventures from the day over the food and some adult beverages. Soon after dinner, Mike rolled out the raffle, consisting of over 40 items, including a full set aluminum skids from Hefty Fabworks. Needless to say it was a phenomenal time! Thank you sponsors! The party continued late into the night, kicking off with a delicious 10th anniversary cake. Sunday morning was damp….however the rain did not stop Mike and Ernie making us pancakes & eggs. Plenty of coffee & espresso provided the much needed caffeine fix after the previous nights’ festivities. We had our fill of wheeling for the weekend, refilled out mod lists, and reluctantly made our way home from what was arguably, one of the best events I’ve attended. B2SR14 was a great success…. It’s left us with a deep longing for more, and we can’t wait for the next Nexterra event! See the pics here ! !